Brief Introduction If you are sharing photos to network, you never know what will happen. Someone could take the photos for their own use,or Malicious revised, you might never even know. Watermark software is a professional photo watermark creator. It can helps you add text,image and logo to your pictures to protect your copyrights, only watermarking software can verifies your pictures are protected from unauthorized use. Our photo watermark software is not only watermarking tool, also can add pretty frames for your like, crop images, batch rename and photo resize etc. Watermark software is a fast batch photo processor and support all popular formats. Function Secure Protection - Add text and image to your photos and digital images,will prevent others from removing watermarks and stealing the photos. Pretty Frames - We provide more a great many frames for you, you can edit it for you want to effects,and these is free. Fast Watermarking Process - The photo watermark software have a Powerful batch processing function, utilizes a fast second generation engine. add pictures of the form as 800 * 600 Pixels, can finish it for you in 10 seconds. 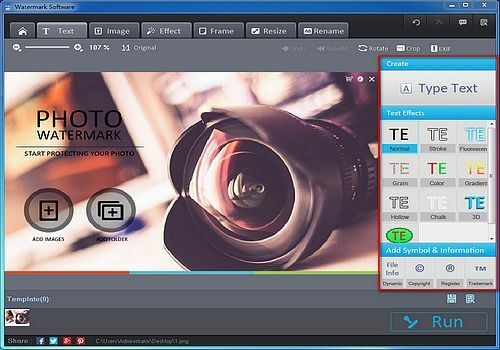 Display EXIF Information - Watermark Software is an useful to understand EXIF information from your digital photos. watermark software provides these information to you, include "Camera Name", "Date Time", "F-Nunber" etc. Support all popular formats - If you add different formats to watermark software, will process them in once, independent of their format. Photo Resize - If your picture isn't suitable size, you can use the function to Resize ,and keep best effects. Only the our photo watermark software can do it. Save your money and time - Watermark software is priced at just $24.90, with no hidden fees. wo provide trial version for you test,and 30-day unconditional money-back guarantee. Laisser un commentaire sur WonderFox Photo Watermark 8.2 Merci de rester correct et de respecter les différents intervenants.